…..and so have I. Oh, my friends, it has been too long. Two months have come and gone in a fog of ‘stuff’. Far too much ‘stuff’, ‘stuff’ cluttering both my time and my spirit. Work, health, family….all these things vie for attention…one becomes thoroughly bogged down in the mundane and the minutiae and, like in a bog, the more one thrashes the more one sinks. ….and then all my technology broke…I could manage without the phone but when the computer went to hospital and didn’t come back I became utt erly discombobulated and exasperated and did the only thing I know how to do…….I retreated to my shed to hide from all the nonsense. Hiding works quite well for a while. I shut out the world and set to work on my soil. Everything was taking longer than usual because of the annoying injuries…but it didn’t seem to matter….no-one could find me on the soil and the longer it took to do the most simple of tasks the longer I could avoid dealing with the things that really mattered. It has taken some time to get things…the ‘stuff’…back on track. The technology was fairly simple to sort out, the family things will always be there, the health will return. Like a sleepwalker I kept my soil going somehow, kept sowing seeds, kept watering, kept fighting the pests…and kept wondering how such a small dot of a seed could turn into a plant. I also kept wondering when my soul and my words would come back. I was sitting outside the shed catching my breath after another long session in the kitchen garden. It was late. Everyone else had gone home. The kettle had long since stopped whistling. All the sheds were tucked up for the night. All the building works around the site had stopped. The sirens on the High Street had stopped. The wind had stopped. The lists and the monologue in my head had stopped. …..and then I saw them…..just for a second. I looked again. Two tiny black specks far, far away on the horizon. I watched. My eyes focused and as they came closer I saw their tails….and gasped with joy. They started their aerobatic display (just for me? )….darting, diving, wheeling above my head….and soon their number swelled and I could not count them all. 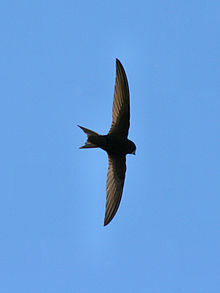 Swifts. I lay down on my back in the grass for a better view and as I mouthed the words ‘they’re back, they’ve come back’ I felt a couple of tears roll down my cheeks and I realised that I, too, had come back. Sometimes we have to wait….and trust. But we will always come back. Next post: One is never alone with a book…. Beautiful Vivi! Tears rolled down my cheeks just reading it!